IT'S RANDOM ACTS OF KINDNESS WEEK! "Through the foresight and leadership of EIE, Internet Safety 101SM has established itself as the benchmark for all other Internet safety programs. The program was thoughtfully designed to educate and empower parents, teachers and guardians on Internet safety, and it was developed in a format that is accessible to everyone and is relevant to the dangers our children face online today." " It might be called Internet Safety 101SM, but it's really a graduate course for those who don't want to watch their child healafter abuse, but keep them safe in the first place." "Enough Is Enough® (EIE) has developed a unique approach to reach parents and adult childcare providers with the best resources and information on Internet safety, and we are aligned with EIE through our partnership for the Internet Safety 101SM: Empowering Parents program, which will ensure that parents receive the best information available about Internet safety concerns, resources and information." "The Virginia Association of Independent Schools would like to commend Donna Rice Hughes and Enough Is Enough® (EIE) for their tremendous work to make the Internet safer for children and families nationwide. The Internet Safety 101SM: Empowering Parents program duplicates the important in-person training services that EIE has been providing for years." "The Salvation Army is deeply concerned about online dangers facing children today, and has been working with Enough Is Enough® for many years to deliver Internet safety training and information to the millions of families and parents we serve across the country. We commend Enough Is Enough® for the development of the groundbreaking Internet Safety 101SM: Empowering Parents program." "As former AG of VA and now as governor, it's a chief priority of my office to keep children safe online. Enough Is Enough® has developed the Internet Safety 101SM Program which was piloted in VA in partnership with my office when I was AG. It's designed to prevent Internet crimes against children by empowering parents, educators, and caring adults to be the first line of defense. " "The program is a powerful tool as it is designed to educate the masses." "I looked through your websites as well as Internet Safety 101SM, and it is exactly what parents in Texas need so they can be informed about their children's internet usage. As a retired principal with a master's degree in counseling and psychology, I know the damage internet predators can cause a young person, damage that can last into adulthood." "WMAL Radio is proud to support Enough Is Enough® (EIE) and the Internet safety program you have created to protect children online. We are very excited about this new program and confident that it will present highly informative and useful information for all the families in our listening audience." "The Internet Safety 101SM program is a tailored-made response to the Internet child safety crisis facing our state and the nation." "We are very excited about the Enough Is Enough® Internet Safety 101SM program, and its goal to educate parents and adult caregivers about Internet dangers and provide solutions to protect children online. The Internet safety training materials that EIE provides will alert and educate parents and adult caregivers about online sexual predators and pornographers who seek to victimize innocent and vulnerable children." "Internet Safety 101SM has established itself as the benchmark for all other Internet safety programs." "I extend my strong support for Enough Is Enough® (EIE) and its work to protect children online. Through years of work empowering parents nationwide, EIE has developed highly effective resources and techniques for educating, motivating, and empowering parents to be the first line of defense in their children's online lives. I believe that EIE's Internet Safety 101SM: Empowering Parents program [will] be a great asset for law enforcement." "This Program is a real wake up call to parents who have been complacent!" "Through Enough Is Enough®'s years of experience and work on this critical issue, and through EIE's singular work with parents nationwide, they are helping to shape the resources and tools that parents and educators across Virginia will receive. We are impressed with and endorse their comprehensive Internet Safety 101SM: Empowering Parents concept." 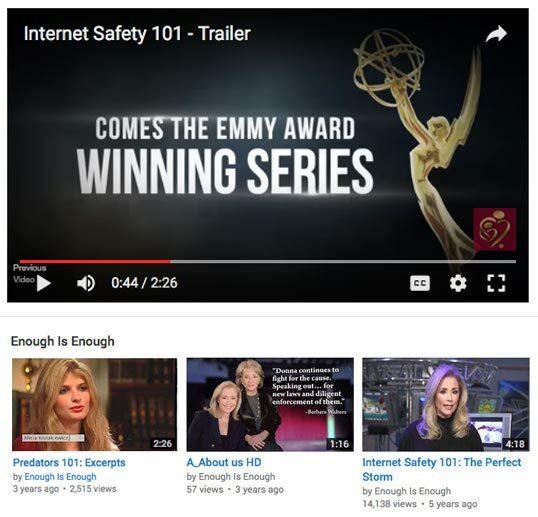 "Fox Interactive Media... excited to work alongside Enough Is Enough® (EIE) on the Internet Safety 101SM program. We commend your efforts as a pioneer and leader against Internet predators, as well as your innovative and effective educational programs. Thank you for all that you do in this important area of online safety." "The subject of Internet dangers is a serious issue for our families, and we are delighted to be able to bring Enough Is Enough®'s Internet Safety 101SM program training to our members under [an AACC] educational series. The series has been a huge success and we thank you for everything you do to protect our families. " "It really opened my eyes about this kind of thing. I wish I had known more when my children were younger. Thank you for this program!"